Climbers or lianas, rarely erect shrubs or small trees, dioecious. Leaves alternate, simple (rarely trifoliolate), exstipulate. Flowers small, unisexual, greenish, actinomorphic, arranged in panicles, cymes or racemes, axillary or borne on the older wood. Both calyx and corolla 2-seriate. Sepals free or united, (4-)6(-8), very rarely 1-3 or none. Male flowers: stamens 6, usually antipetalous, sometimes 3 or 2 or more; filaments free or connate; anthers short, often extrorse, 1-2-locular dehiscing by a longitudinal, transverse or circular slit; rudimentary carpels minute or absent. 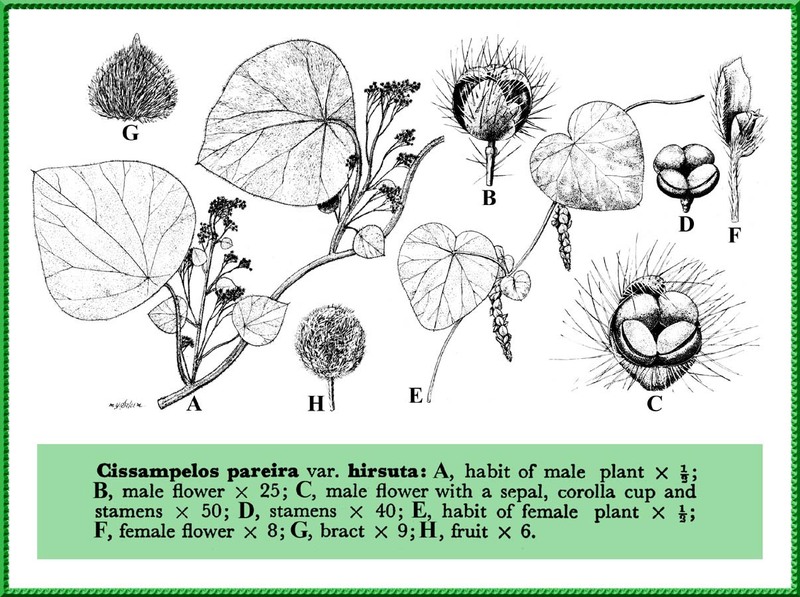 Female flowers: staminodes 6 or absent, carpels 3 or 6, rarely one or several, free, sessile or stipitate, uniovulate. Fruit drupaceous with a style-scar subterminal or basal due to eccentric growth. Seeds often horseshoe-shaped; albumen copious, ruminate or absent. Anatomically, the wood is characterized by the presence of broad medullary rays alternating with wedges of wood and by the large vessels. A family with about 65 genera and nearly 350 species, mostly tropical and subtropical. Represented by 4 genera and 5 species in Pakistan. It is closely related to Lardizabalaceae, but can be easily distinguished by its drupaceous fruit and the often curved horseshoe-shaped embryo. Cebatha Forssk. = Cocculus DC. Holopeira Miers = Cocculus DC. Menispermum L. = Cocculus DC.